I’m always on the lookout for ways of engaging people in sustainability. And I just realised that I have a great tool on my shelf already. So, here’s something completely different that does that engaging: Fluxx. Fluxx, from Looney Labs is a card game that is all about change. It is a draw-play-discard game in which players try to win by meeting the conditions specified by the Goal card. How the game is played, and indeed how the game is won, constantly change during the game. 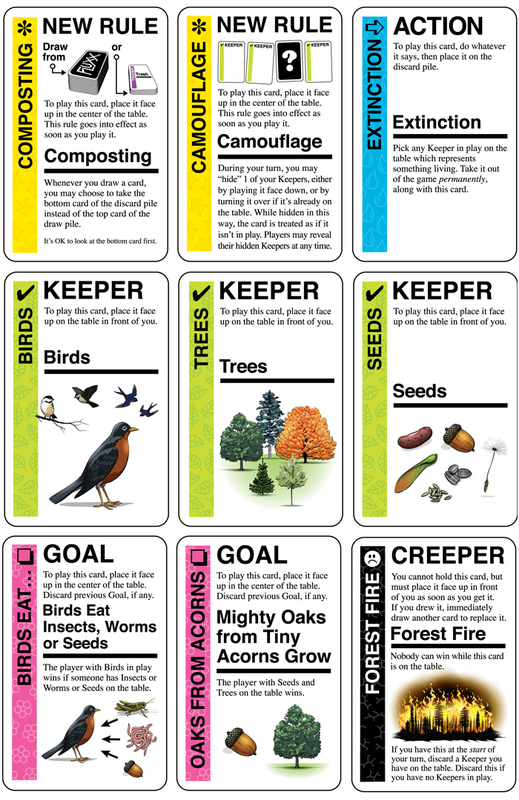 There are four types of card: Keepers, Goals, Actions, and Rules. At the start of the game the basic rules state that you pick up one card and play one card. If you play a Rule card, this may change how many cards are picked up, can be played, or many other variations – how many cards you may have in your hand; the order of play; bonus cards; and so on. Keepers are played to the table in front of the player. Action cards specify one-off actions: swap hands, pick up extra cards, steal a keeper. How the game is won is specified by the current Goal card – usually, but not always stating that you win if you have a particular pair of Keepers. Sometimes the goal says you win if you have a particular Keeper and no-one has another particular Keeper. So, a turn consists of drawing cards, playing cards, and discarding down to the current hand and Keeper limit. Players try manipulating the rules in their favour- if you have a hand-full of cards you might chose to play a card that increases the number of cards playable in each turn. The game though, usually defeats such attempts at manipulation – the next player changes it to something else, or conditions change so that having many cards is an advantage. There’s little chance for long term gameplay strategy. Sometimes the winning is unexpected and the winner as surprised as the other players. So, why am I writing about a game that surely sounds crazy and is, in practice chaotic and unpredictable? Why do I think it a useful introduction to sustainability? Three reasons. First, unlike almost every other game, the winning conditions in Fluxx are not derivatives of “he who has the most gold wins”. Whereas in Snakes and Ladders we delight in another player’s slippery downfall, in Fluxx someone might lose all their cards but the next minute win the game largely on the basis of having the fewest cards. Whereas in Monopoly we build hotels on Parklane to extract money from our opponents, and success is driven by a mercenary purchase of the entire side of dark blue (Mayfair and Park Lane) and all the green streets (Bond, Oxford and Regent), in Fluxx while some goals need more cards, and winning is often about particular cards, which particular cards matter can change several times between your plays. Instead of accumulation of wealth and mercenary self interest, success is about good humour while adapting to changing conditions. Second, soon the players realise that winning is really about having a good time with friends or family. It is wrong to say that Fluxx has no rules, it clearly has an underlying system – it is only the expression of the rules that really change. The deeper basics of taking turns, playing according to rules (albeit changing ones), and so on are still there and give a basis for this “good time” engagement. This might be a case of Robert Fulghum’s All I Really Need To Know I Learned In Kindergarten, but it really is a useful lesson in rethinking your style of engagement and measures of success. While we are playing to win individually, we put as much effort into the combined experience – if we are nasty to someone they stop playing and we all lose. Third, Fluxx doesn’t take itself too seriously. While I’ve described it here as useful in teaching sustinability (and similarly useful for Agility in software engineering), Looney Labs has no such intention. Actually one version “EcoFluxx” does, and largely fails because of it. Despite its name I don’t really like EcoFluxx – it takes itself too seriously. And while it is perhaps properly named, it should perhaps better be described as Ecology-Science-Fluxx. Goals are of the style “birds eat worms” (image). It seems incongruent that this level of rule and goal might change – they don’t in nature. The Monty Python and Pirate versions are appropriately silly that you are quite prepared for rule changes. As one Fluxx reviewer stated “Everyone had a good time, and it wasn’t important who won”. So long as “everyone” is taken widely and over the long term, wouldn’t this be a great goal for humanity instead of national strategies entirely dependent on exploitation or growth? What are the underlying principles that persist despite ever-changing conditions? How can our perception that includes a focus on both the obvious rules and the changing conditions, also expand to an understanding of the wider game?